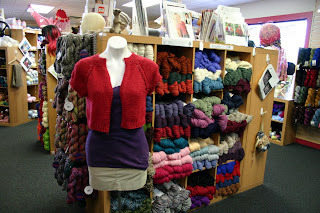 Yarn and Fiber Happenings: New Yarns, Patterns and Buttons Galore! New Yarns, Patterns and Buttons Galore! Spring has sprung and the beautiful colors are upon us once again! The colorful flowers embedded in the green grass reach up to face the warm sun as she peeks through the newly formed leaves of the towering trees which lean upon the bluest skies.....ahhh.... Spring! Creative juices flow from our veins to try to capture these beautiful colorways and make them our own --- with of course the help of our favorite mediums --- yarn, rovings, fabrics, buttons and interesting and fun patterns! Plymouth Yarns Linen Concerto is a new and fun yarn that is perfect for beautiful Spring garments! Linen Concerto yarn is a machine washable blend of 48% Rayon, 42% Linen and 10% Cotton which is available in solids and self striping colorways! 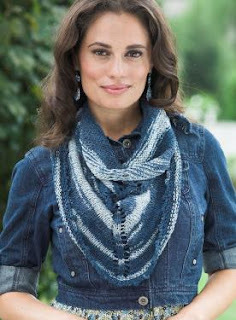 Try this cute Picot Shawl which uses Linen Concerto yarn - this is a perfect shawl for cool evenings. You can take this beautiful little shawl with you to throw over your arms when you are in air conditioning or make one for your friend that can't wear animal fiber. It makes a perfect gift. Buttons, buttons, and more buttons arrive weekly! Our button collection is getting huge with lots of selection! We carry novelty buttons, glass buttons, silver buttons, gold buttons, funky buttons, small buttons, large buttons and many buttons in between! A variety of colors, shapes, sizes and styles to meet your button needs! On special this week - Bonnie Maresh Glass Buttons - 25% off! Sale runs through Monday, May 27th at 6:00 PM EST. No coupon necessary; sale price is shown on website and valid in-store as well. This collection of handmade fused glass and lampwork buttons includes beautiful hand made fused glass buttons from Bonnie Maresh Buttons. These wonderful buttons are sold here individually and each button is a unique work of art. Newly restock in many, many colors is a new favorite of ours, Baby Alpaca Grande Yarn!!! This scrumptious yarn is available in solid, Sparkling Glow, and Grande Hues. This is the perfect yarn for hats, mittens, scarves, shawls, and this beautiful Baby Alpaca Grande Quick Top Down Jacket Pattern. Make this perfect little jacket with only 3 or 4 skeins of Baby Alpaca Grande in your choice of color! Or choose one of the many, many patterns available to make soft and scrumptious garments! Happy fibering and have a wonderful week!